I don’t know if I want to see a little bit of Ron Swanson in everyone, but clearly, if you major in Forestry, you have a bit of Swanson in you. According to the College Board, “If you go into forestry, you’ll have to balance growing trees for wood products with preserving the variety of living things in an area.” Apparently 119 colleges offer degrees in forestry, including SUNY Morrisville, which is near my alma mater. 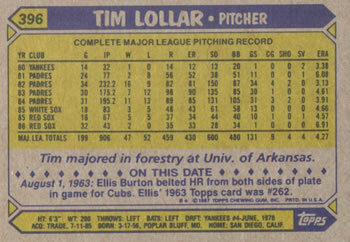 Lollar had a meandering career for a guy who spent just seven years in the majors. He was drafted in the fourth round in 1978 by the New York Yankees, made his major league debut two years later and was traded the subsequent year to the San Diego Padres in a deal that brought our man and fellow flip sider, Ruppert Jones to the Pads. He did his best and worst work for the Padres. By far, his two best seasons were 1982 and 1984. Unfortunately, his 1984 post-season experience was horrible. He started one game in the NLCS and World Series. In the NLCS, he pitched 4.1 innings and gave up three runs. He’d be mightily worse in the Series, going just 1.2 innings and giving up 4 runs. After the season, he, Ozzie Guillen, Bill Long and Luis Salazar were traded to the White Sox for LaMarr Hoyt, Kevin Kristan and Todd Simmons. This wasn’t a particularly good trade for the Padres. Guillen was worth 14.9 WAR for the Sox and Long was worth 2.1 WAR. Salazar (-0.5 WAR) and Lollar (0.4 WAR) cancelled each other out. 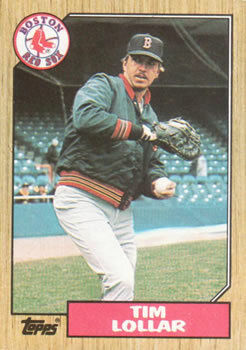 Meanwhile, Hoyt was worth 1.7 WAR and pitched for the Padres for just two years. Neither Kristan nor Simmons made the majors. Aside from being part of the deal that brought Guillen to Chicago, Lollar is likely remembered for his hitting acumen. He finished with a .234/.286/.377 line, but hit 1.000/1.000/1.000 in his last year in the majors. He did hit eight round trippers in just four seasons in the NL. And, somewhat bizarrely, he pinch hit for position players twice in the American League. The first was August 13, 1985, when he hit for Jackie Gutierrez (who finished with a .237/.261/.285 line). The second was on August 12, 1986, when Lollar hit for Rey Quinones (another no-hit shortstop who finished with a .243/.287/.357 line). Lollar actually singled off Dan Quisenberry, but that no-hit slacker Wade Boggs grounded out afterward to end the game. At least Lollar went out on top, singling in his last MLB at bat.